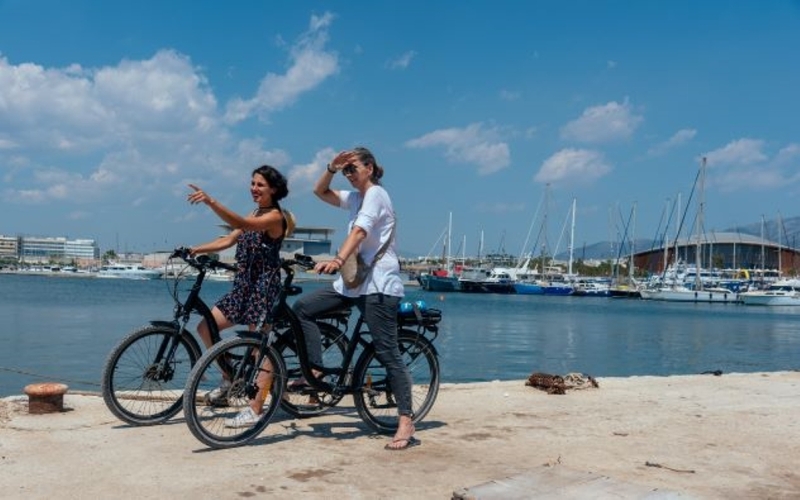 For those who want to get a break rom the busy city and enjoy more cycling this is a nice ride of a little over 3 hours and about 25 kms, that will take you along the Athenian coast line. We will start at our offices at Thissio pass Kerameikos and join the cycle road towards the coastline, passing from Athenian neighborhoods. Upon arrival at the coastline we will enjoy the views of the sea, the marinas, the impressive and luxury yachts, the small sailing boats, the impressive Trireme replica of the ancient warship and Averoff. A nice ride along the coastline with an optional small stop for coffee or drinks in a by the sea place. Even a swim if weather permits is possible, so bring your swimwear! Heading back we will pass from the Stavros Niarchos Foundation Cultural Center, with its impressive modern building and amazing views. Children 5-9 on booster seat € 15. Infants 0-4 free of charge. This tour is available in English, Dutch, French and upon request German, Spanish & Italian.